Located in Honolulu, Hawaii Alan Wong’s offers an intriguing fusion of Asian influenced cuisine with native Hawaiin ingredients, all inspired by French technique. The incredibly creative dishes and stellar service make Alan Wong’s one of the most sought after restaurants in Honolulu. Notable dishes include the Ginger Crusted Onaga and the Red Wine Braised Short Rib of kalua pig. We were so impressed by Alan Wong’s that we visited twice during our week-long vacation! In order to sample a wide variety of dishes about which we’d heard so many rave reviews, we ordered the 5-course Menu Sampling ($65 per person) and were basically blown away at each stage. The flavors were so vivid and appealing, and the presentation absolutely extraordinary! To begin, we had the “Soup and Sandwich” appetizer. The smooth soup consisted of chilled vine ripened red and yellow tomatoes and was creatively presented in a martini glass, which we were told to boldly sip from if we wished. The soup was accompanied by a thin slice of fried parmesan meant for dipping. The flavor of the soup, as well as the parmesan strip, was simply wonderful. It paired perfectly with the other creations of this appertizer, namely a mouth-watering, tiny grilled sandwich stuffed with kalua pork and truflles. The soup and sandwich also came with three delicate pieces of Nori Wrapped Tempura Ahi served with a delightful Tomato Ginger Relish. This was just the start, and we were already won over. The next course was the much talked about Ginger Crusted Onaga with Miso Sesame Vinaigrette, and Shiitake Enoki Mushroom Corn. This was very good, although not our favorite dish of the evening. However, many native Hawaiins we spoke with about Alan Wong’s absolutely raved about the Onaga. We found ourselves in raptures over the next course, Pan Roasted Day Boat Scallops with Sauteed Spinach and Mushroom, with a Truffled Foie Gras Coulis. With every bite, you were keenly aware of the freshness and quality of the ingredients. And what a decadent combination! Just when you thought the menu could not possibly surpass itself, The Red Wine Braised Short Rib with Sauteed Mushrooms and Macaire Potatoes was served. The meat, kalua pig, was prepared to absolute perfection. It was a most tender morsel that melted in the mouth, infused with the red wine sauce and bursting with its own rich flavor. As you read, you’re likely thinking – what wine on earth do you pair with this variety of dishes and flavors? We couldn’t think of the perfect partner, so we just chose a great wine for its own sake – a rich, deep-colored, and very impressive 2001 Shirvington. It was fantastic and did in fact complement our meal to our satisfaction. All things must come to an end, but Alan Wong knows how to do this with panache as well. For dessert, we sampled the rightfully famous Chocolate “Crunch Bars”, made of layers of Macadamia Nut Crunch and Bittersweet Chocolate Mousse. Also, a mouthwatering, rich and creamy Lilikoi (Passionfruit) Cheesecake graced our dessert plate. We paired our desserts with cups of 100% Kona Coffee, and may just move to Hawaii for the java. Served in individual French presses, this coffee was paradisiacal. The Sampling Menu allowed us to taste a variety of his creations, but it also demonstrated that there is little if anything that this chef can’t do. No matter what you choose to eat, your visit to Alan Wong’s is sure to be a memorable one. Now, a few important notes on logistics: First, reservations are highly recommended. Though we were seated at our reservation time, we have heard from reliable sources that a considerable wait (half hour) may even be experienced even with reservations. If this happens to you, BE PATIENT. It’s worth it! For reservations or for more information, call 808-949-2526. Second, Alan Wong’s is located on the third floor of a small building on South King street. Parking is tight in Honolulu in general, and the myriad of one-way streets are a challenge to navigate. You may consider taking a cab, or making use of the valet parking for the parkade below the building. However you get there, get there! An awesome experience. We give Alan Wong’s Five Stars – Outstanding! Halekulani, the “House Befitting Heaven,” is aptly named. Located in Waikiki, the hotel overlooks majestic palms, a private strip of sandy beach, and then beyond into the endless stretch of the blue Pacific. Serenity washes over you at every turn at the recurring sight of native Hawaiin flowers and plants, and in the the welcoming rooms decorated in soothing, muted cream tones. The swaying sound of traditional Hawaiin music floats through the evening air from the lanai of House Without A Key, the hotel’s popular outdoor lounge. 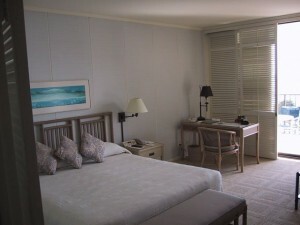 Comfort and serenity truly await in this corner of Hawaiin paradise. Situated directly oceanside, Halekulani looks out onto Gray’s Beach, part of the greater Waikiki beach, traditionally associated with healing and renewal. This location says a lot about the feelings of well being this resort successfully inspires in its guests. Halekulani is close enough to the bustling shops and restaurants of downtown Honolulu – a short walk will get you in range of almost any store or eatery imaginable. Yet with its palm-lined ocean view, serene open air courtyards, and abundance of lush Hawaiin flora, the hotel transports you to a place of peace and calm. The lobby itself is remarkable. Without doors or windows, the entrance welcomes you in along with the perpetually perfect Hawaiian air. An enormous, stunning floral centerpiece is the first thing that comes into view, and then the vast open grassy courtyard just beyond. A stroll toward the courtyard reveals several tranquil sitting areas, with comfortable chairs and love seats. The colors of the furnishings and décor throughout the hotel are muted and natural, allowing the vibrancy of the fragrant blooms and lush greenery to take center stage. Stunning stone fountains do double duty in the front seating area by delivering a sense of calm and effectively masking the sounds of traffic which, unbelievably, are quite present just beyond them. Heading toward the inviting ocean and blue sky, past a row of beautiful shops (artwork, jewelry, resort clothing and sundries) you’ll find Halekulani’s restaurants and the gorgeous pool area. The pool itself is characterized by a stunning orchid pattern, made of over 1 million glass mosaic tiles, inlaid in the floor of its 46-by-82 foot dimensions. The lounge area is comfortable and spacious, with shade provided by enormous palm trees, should you desire. Towels and fresh, comfortable terry lounge chair covers are provided, and attendants circulate to take drink orders. And of course, the view of the ocean is beyond description. A wonderful feature of Halekulani is the in-room check-in service. Rather than making our initial arrangements on our tired feet in the lobby, a reception staff member accompanied us to our room and check us in there, personally pointing out the room’s amenities and giving a brief but informative verbal orientation to the hotel. The only draw back to this service is that the room and the view is so incredible, it may be hard to keep your mind on checking in! Our room was quite spacious, and decorated in creamy muted tones, allowing the azur blue of the ocean and sky beyond the window to be the focal point (lof course, you should be aware that not all rooms have an ocean view). We had a balcony that allowed us to gaze over the tops of the high palm trees and to catch a bird’s eye view of the famous “Orchid” pool and the evening hula show at House Without a Key. Our bathroom was fairly large with a soaker tub and separate shower. It was regularly restocked with good-quality amenities. We appreciated various small but memorable touches throughout our stay, including the bowl of fresh Hawaiian fruit (guava, papaya, banana) awaiting us on our arrival, consistently prompt and thorough housekeeping service, and the presence of little gifts on our pillow left for us at turn down. The excellent service at Halekulani is definitely worthy of further note. Everyone was genuinely friendly, extremely accommodating, and seemed truly concerned that our stay was carefree. We became especially fond of the staff who parked and retrieved our car, each day offering directions and a willingness to help us with any question or concern. Halekulani boasts several dining options within the hotel itself. The House Without a Key is a gorgeous open air lounge area, great for drinks and snacks in the evening, and also open in the mornings for a buffet breakfast. Even locals are drawn to the place, especially for Mai Tais and appetizers at sunset, to watch the sun sink into the ocean beyond the stage to the tune of Hawaiian hula music and mesmerizing hula dancing. This place quickly became a favorite of ours. We sipped many an orchid-bedecked Mai Tai, and tried tasty appetizers such as coconut shrimp, spring rolls and the complimentary “Maui Chips”. The aptly named Orchids (several varieties of this graceful flower grow throughout the restaurant) restaurant is also open to the air and the ocean. Breakfast is served here (the sweetest pineapple you’ll ever taste! ), and a tantalizing dinner menu is also offered (reservations are recommended). Finally, La Mer, Halekulani’s premiere restaurant offers elegant fare and an award-winning wine list. For lighter snacks, drinks or afternoon tea, you may also visit Lewer’s Lounge and the Veranda area. This location also features musical entertainment on certain evenings. As the Halekulani is located in the heart of Waikiki, you’re in walking distance to huge public beaches and lots of shopping. Nearby stores are sure to satisfy every taste and price point, with the curious mix of swanky shops like Coach in Waikiki’s “Luxury Row” alongside ubiquitous souvenir and sundries stores. You will not go hungry either – an impressive array of restaurants lines the streets near Halekulani. A particular favorite seems to be The Cheesecake Factory. You’ll recognize it by the throngs of people outside its doors holding those restaurant pager gadgets willing to wait sometimes over an hour and a half for dinner! A short distance away are other worthwhile attractions. The lush Honolulu Zoo is practically down the street from the hotel, and is a pleasant way to spend an hour or two. Not too far away is Diamond Head, perhaps the most famous volcano crater in the world. 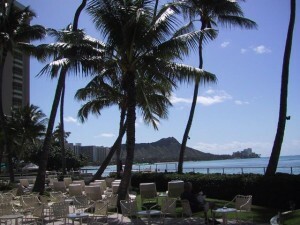 Diamond Head can be seen from Halekulani’s pool area and the open-air areas of Orchids and House Without A Key restaurants. Be warned that if you are going to climb Diamond Head, it is a steep hike – be sure to wear proper foot gear and bring plenty of water. Despite what you may hear about stairs and railings, this is a long, hot walk. The view is beautiful, but you will work for it. Halekulani staff will be happy to arrange transportation for your touring needs. We recommend taking taxis to restaurants that are just out of driving range to save time navigating Honolulu’s often baffling maze of one-way streets, and to spare yourself the challenge of actually finding parking (you may want to consider this even if you have rented a car). A favorite dining discovery of ours was Alan Wong’s, and we’re convinced that the experience was enhacned by the fact that we didn’t have to locate it and negotiate parking by ourselves! Thanks to a cab ride, we arrived in time and sipped our wine without a care in the world! However, in general, we would certainly recommend renting a car so that you can get out there and experience Oahu. We drove almost the entire perimeter of this beautiful and dynamic island, taking in the phenomenal surfing beaches like Waimea, Makaha, and bohemian surfing towns (you must go to Haleiwa on the North Shore). You can’t go wrong taking in the sights at your own pace, stopping where and when you want to and being open to discovery and adventure. It’s hard to say too much about the first-class treatment and slice of paradise we experienced at Halekulani. We would highly recommend it to the traveller looking for the best in rest, relaxation, and luxury. 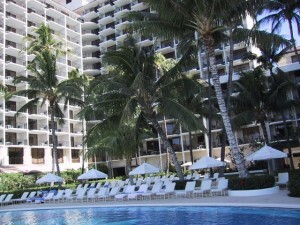 We give Halekulani 5 Stars- Outstanding! Halekulani is located at 2199 Kalia Road, on Waikiki Beach, Honolulu, HI. For hotel reservations, call toll free 800-367-2343. 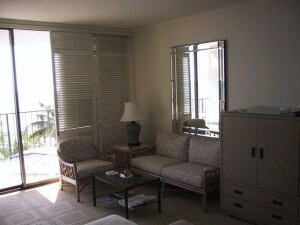 For more information, call 808-923-2311, fax 808-926-8004 or visit www.halekulani.com. Honolulu. The name ripples off the tongue like the undulating movements of a hula dance. If there is a paradise on earth, surely it is to be found among the islands of Hawaii, with its white sandy beaches, great stretches of ocean, swaying palm trees, and warm, breezy climate year round. There are many ways to indulge while in Honolulu and on the island of Oahu. There is, of course, the “natural way,” by strolling the gorgeous beaches, swimming in crystal-clear waters, and simply soaking in the heavenly warmth of the sun. Then, there are luxury accommodations to enjoy. For instance, Halekulani, an upscale hotel located in Waikiki, whisks you off the busy streets and into a center of tranquility and calm. A luscious, open-air courtyard and impeccably-trained staff greet you upon arrival, and set the tone for the rest and relaxation that await. Unwind in your gorgeously appointed room, and then stroll to the House Without A Key lounge, opening up onto a spectacular ocean view. Sipping your Mai Tai, you will have a particularly memorable experience when the sun sets to the sounds of live, traditional Hawaiian music and dance. World-class food and wine are also offered Honolulu. We recommend especially a visit to Alan Wong’s, who’s creative Asian/Fusion dishes will thrill the senses. And of course, an outstanding wine list is available, sure to please even the most particular wine connoisseur. For the jet-set shopper, the streets of Waikiki will not disappoint. Though the obligatory Hawaiian shirt and plastic hula-girl peddling gift shops abound, you will also find Tiffany, Coach, BOSS, and more in Waikiki’s “Luxury Row”. Consider Honolulu in your upcoming vacations plans. Paradise certainly awaits. Trendy, contemporary, hip. These are the words that will no doubt occur to you when you walk into Nectar at the Bellagio hotel, struck with the sight of strange stalactite-like pillars and walls painted in a blend of colors. The ambience is more high energy than intimate with its open kitchen concept and brightly lit adjoining cocktail lounge, and there is a slightly crowded feel in the single room dining area, especially if you are seated at a table in the center. At Nectar, you will find dishes typically offered in fine American restaurants, with an emphasis on interesting combinations and modern presentation. The menu offers familiar starters such as Caesar Salad, and clearly recognizable beef and chicken dishes as entrees – the usual suspects, but prepared with care and presented quite attractively. The 8 oz filet mignon, for instance, was tender and flavorful accompanied by sauteed oyster mushrooms and shallots, and potatoes romanoff with a delightfully crispy exterior. The notable feature of this dish was the intriguing rich, sweet port sauce generously dressing the beef. My dining companion had the hearty 14 oz prime rib. Resting in a pool of au jus, the beef was served with shallots, a warm corn and bean salad, and deep fried potato wedges. The accompanying creamed horseradish sauce was pleasantly zesty. The wine, a 2000 merlot, was pleasant although not exceptional. I must say that though there was nothing wrong with Nectar, the menu was pricey, especially when compared to the exceptional menus and elegant ambience of Bellagio’s other fine restaurants. Overall, the food was quite good at Nectar, and our waiter was exceptionally pleasant. The whole experience was overshadowed by the finest of the fine that Bellagio has to offer – a perhaps unfair comparison. You may want to visit Nectar earlier in your trip before trying the likes of Prime, Aqua and Picasso. Another bit of valuable advice – make reservations for Nectar as far in advance as possible. We were fortunate to secure a table here after we arrived in Vegas, but unable to get into other restaurants at Bellagio on short notice. Late reservations at popular Bellagio restaurants are a gamble, so hedge your bets and book early! 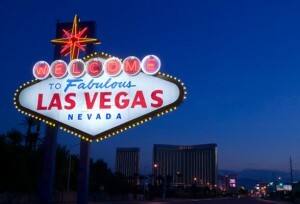 Nectar is located in the Bellagio Hotel, 3600 Las Vegas Blvd South, Las Vegas, NV 89109. For more information or to make reservations, call 702-693-7223 or visit www.bellagio.com.